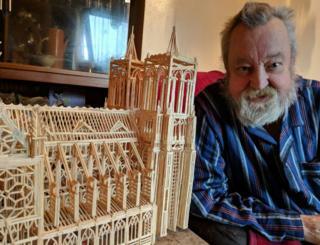 A man has spent a year making a replica of Notre Dame Cathedral using 12,000 matchsticks. David Harding from Welwyn Garden City in Hertfordshire said he put in about 1,000 hours of work, with each spire taking a week of painstaking gluing. "It's just something to do... I really enjoyed doing it," he said. The creator has completed other iconic buildings out of matchsticks including the Leaning Tower of Pisa, Tower Bridge, and the White House. Mr Harding said he bought a design plan to work from and also had to buy special larger sticks "which are very cheap" to construct the replicas. "I sit here between four and six hours a day, six days a week. I just love doing it. I'm listening to the telly and doing my matchsticks," he said. "Tower Bridge I hired out to a film company and got £300 for the week and hopefully, [this one] is not quite finished yet - I've got to lacquer it - hopefully I'll sell this one because those who do it in America make a fortune." He said if he sold Notre Dame he would expect it to fetch a "fair price" of about £1,000. Not all his matchstick creations are of famous buildings. He is currently working on a bungalow which will also have a veranda, satellite TV dish and a chimney pot. His top tip for anyone wanting to build similar things from scratch is to take plenty of photographs then draw the plan and "you can make anything - budgie cages, motor cars, lorries".